A powerful set of tools to migrate content from Livelink Content Server to SharePoint in a manageable and cost effective manner. Moving to SharePoint? The Livelink Content Server to SharePoint Migration Tool allows you to easily plan, organize and migrate your content to SharePoint and/or Office 365 hassle free. Easily migrate content from Livelink Content Server to SharePoint with the click of a button. Support document versions and mapping of system attributes. Option to migrate content to SharePoint Online. Easily Restructure your content and move folders, shorten paths and exclude data from your migration plan. Option to map Livelink Content Server permissions and group mappings to SharePoint. Option to map Livelink Content Server metadata (Category/Attribute) to SharePoint Content Types or Columns. Preserve your legacy document links from emails, documents, shortcuts, and 3rd party application links. Migrate your records management classifications and other RM metadata with your documents. Migrate content from Livelink Content Server Wiki’s and Blogs to SharePoint. Maintain your Created By and Created Dates from Livelink Content Server on your documents in SharePoint. Preserve your Last Modified By and Modify Dates from Livelink Content Server on your documents in SharePoint. Apply new and additional metadata during migration. Automatically create a SharePoint Document Library to migrate content into. Migrate Content Server Attribute Sets to SharePoint Content Types. Migrate Documents from Personal Workspaces into SharePoint. Automatically corrects documents with missing extensions. Configure invalid mime types to a mime type that works in SharePoint. Option to specify a limit on the size of documents to be migrated to SharePoint. Migrate directly to SharePoint. No requirement to download documents from Content Server first and then upload to SharePoint. No requirement to install software directly on your Livelink Content Server or SharePoint environments. Audit logging of all migration operations. Leverage ECM Wise Services’ SharePoint Records Management expertise. 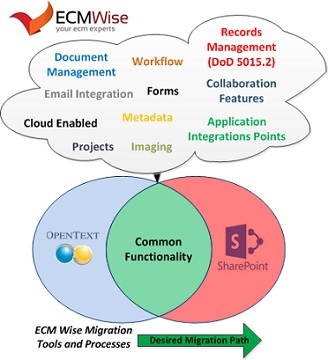 ECM Wise has extensive experience in Livelink Content Server to SharePoint migrations. From working directly with our clients, we have identified a common need for helping organizations centralize on a single Enterprise Content Management System. We are the pre-eminent experts in Livelink Content Server to SharePoint migrations. Exclude content from your migration plan. The Restructuring Wizard allows you to easily drag and drop folders into a taxonomy that fits your organizational needs. Visually reorganize your content pre-migration in an easy to use interface. If your organization uses both Livelink/Content Server and SharePoint, leverage the ECM Wise Content Server to SharePoint Migration Tools to consolidate your ECM needs into one System. Realize savings in licensing, support, hardware, staff and solution complexity. We understand you want the most out of your investment so when you contact ECM Wise for assistance with the Livelink Content Server to SharePoint Migration Tool, be assured that you are contacting our most experienced support staff. In fact, more often than not, issues are resolved with a first response.